Diversification is a concept that I’ve embraced all my life. In the past, I have discussed investment diversification and also touched on the concept of income diversification. Today, I want to more thoroughly explore the idea of diversifying your income. When you think about income, most of you will immediately think about your full-time job (or part-time job). However, if you want to retire, you’ll need income from other sources beside your job. As such, a way to determine how close you are to retirement is to look at how much income you have that is not coming from your job. The general rule of thumb is you’ll need about 80% of your current income to retire. Retirement aside, diversify your income is something that I believe you should start working on as soon as you can. Making sure your savings earn the highest interest rate possible. Move some of your savings into CDs and build a CD ladder. Invest in the stock market. If you’re younger, try to invest for long-term growth. If you need immediate income, you can invest in dividend paying stocks. Make sure you diversify your investment and invest in other asset classes, such as, bonds, commodities, and REITs as well. If you have extra money, you can try a more non-traditional investment like Lending Club. Here is a link to my sample Lending Club portfolio. As you build up your investment portfolio, you can also work on other sources of income, such as rental property income and business income. In addition to the ideas suggested above, take a look at my other articles: Extra Income Guide and 40+ Passive Income Ideas and Ways to Make Extra Money for more ideas on how to build additional income streams. This is something that I feel is sooooo important. I wish more people would blog about this aspect of our personal finances. For me I’ve started to develop a number of alternative income streams, because just like any business, you don’t want to have all your eggs in one basket. What a great concept! Having multiple streams of income is the way to go…ESPECIALLY in this econmoy. Awesome article. The best thing about investments, is that it never gets old. You can’t retire from investing. I am not sure I understand. Wouldn’t things like CD ladder or dividend stocks be an investment income rather than an alternative income? @Archanfel – For me, there’s no difference. Alternative income is a very broad category of income that include any income sources, excluding your primary job. So alternative income does include income from second job, investment, business, etc. Diversification is great. Many look at diversifing into something that most other people also diversify into. Not always a bad thing. The new savings account is great because $5000 will be tax free. This is great, however one must consider that if the real interest rate is negative, saving is pointless if one is looking for income. So to diversify, one first needs to determine an appropriate portfolio. Real estate is one, stocks another, cash, bonds, and pms for inflation protection. Do you have some in all these asset classes. If one is limited, just stick with something that has given real returns in the last 7 years and counting. Diversification is ideal for a lot of people, but I think a lot of us don’t do it because we lack resources or don’t look into it too deeply and procrastinate. Some people don’t even open savings accounts and keep money in checking accounts because they don’t want to go through the hassle. Or, they don’t realize they are missing on savings accounts with higher rates because they don’t know about them. There are always resources people (Ahem, Thrive 🙂 ) and diversification can be done in easy, passive ways and don’t always have to be a headache to think about. After reading Kyosaki’s book and Robert Allen’s materials a couple of years ago, I decided that I would be in this for the next 10 years minimum. By establishing a long term commitment to alternative streams of income, you will be less likely to give up. This is something we have to work at consistently and patiently. By the time retirement comes, I would like active work to be optional. Having said that, I love working! So I will probably always work, but it is nice for it to be optional. An alternative income stream is something I would like to try to establish, although being young it’s difficult because I don’t have the funds or knowledge to dive into a business or rental property. I may be trying my hands on blogging like you, and treat it as a business and hopefully over a year time can turn some side income on. It’s hard to believe that in 2009 two incomes doesn’t quite cut it anymore. I am currently working on saving as much as possible from my salary and putting the savings in long-term CD ladders plus my rewards checking accounts. I am currently earning about 5% of my total income from interest income. I absolutely agree that income diversification is important. It is ever more important in this economy. If all of your income stems from one location and you lose your job, you better have an emergency fund. 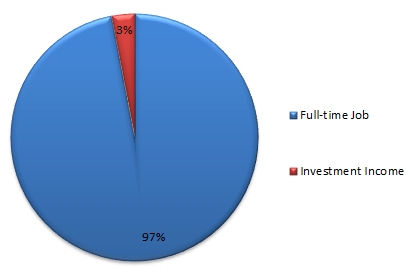 My income comes mostly from my current job, but I also tutor on the side to make extra money. If I lost my job today I would be able to increase my tutoring hours until I found a new job in order to replace some of my income. I’m trying to diversificate my income. Diversification and planning is key. Not only does it make financial sense, but the piece of mind it affords is worth it ten times over. For example, after we saved and achieved our goal of a 6+ month emergency fund, we knew that that if our normal income is disrupted we would have plenty of time to get things on track again. It has enabled us to take risks and make positive changes we would have been too afraid to do before. Keeping this reserve, building alternative sources online, mystery shops, part time work, are ways we diversify.